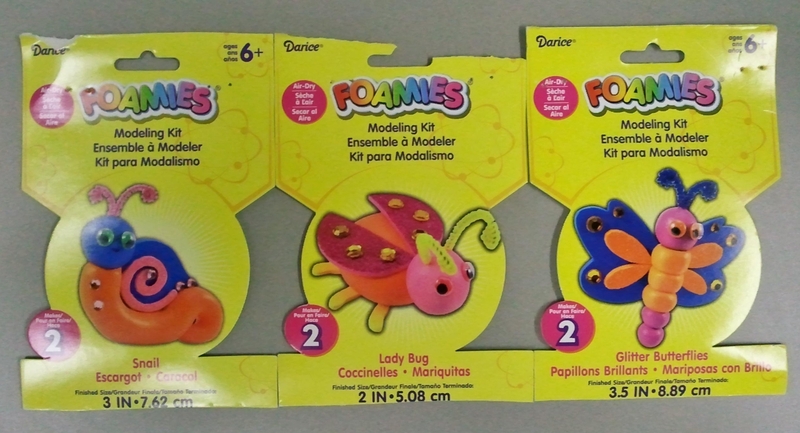 Foamies modeling kits | Random moosages as I see fit. It’s another craft review! Huzzah! tl;dr? Verdict: Appropriate for elementary school kids. You might think that would be obvious since the package itself says it’s for ages 6+, but sometimes they use weird mutant 6 year olds or something for testing. Also, provide some glue. A few weeks back, I mistakenly thought I needed to prepare a craft for the following Sunday’s craft time with the younger kids. The thing was, it wasn’t my turn to be with them, so I couldn’t do any number of crafts that I already had in mind. That’s because I’ve been told that the crafts I choose to do with the kids are “complicated” and likely come out of the engineer in me. Meh, I says to that. MEH. They aren’t hard and the kids are smarter than you think. Whiny, yes. Dumb, no. As it turns out, it was all a miscommunication. I wasn’t responsible for providing the craft. But the modeling kits still seemed like a good idea and a good emergency craft that doesn’t take a lot of prep work. So, I tried them out with the junior high and high schoolers again (because I often use them as my test subjects) to see how they would react to the craft. It also helps me gauge the amount of time it would take to do the same thing with the elementary school kids. What I found is that yes, you can do these with younger kids, BUT you probably will also want to provide some glue and be patient in trying different ways to assemble these things. The kits are very generous with the clay. You have more than enough clay to make the two of the featured item. However, you only have enough eyes for two creatures so if you want to use the extra clay to make another critter, you need to provide your own googly eyes. Speaking of, that might not be a bad idea overall, because the eyes they provide are kind of strange. The eyes don’t have “whites” per se. 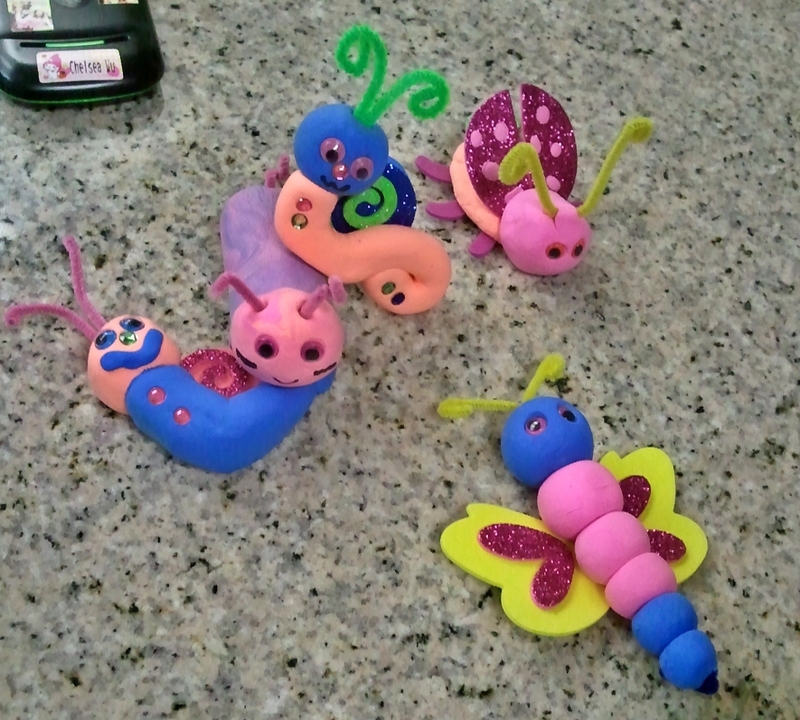 They are all colored and it makes me think that these snails or whatever are all diseased. That might just be me, though. Aside from providing your own eyes, you will also want to provide some glue. The kits’ (wondrously detailed) instructions only say to look at the picture and construct something similar out of the parts they give you. Later on it says that you can try using the clay to stick the eyes and rhinestones on your creation. That…doesn’t work very well. The clay isn’t very sticky. It even has some difficulty sticking to itself. If you want to put the rhinestones or foam pieces on your creation, glue is the way to go. Otherwise, the pieces might stick for awhile but the moment you move your creation, stuff starts falling off. I'm not really sure what that lavender thing is. One of the girls got creative and decided to combine a bunch of extra clay and make something different. Also, I think the mouth and cheek lines are Sharpie. 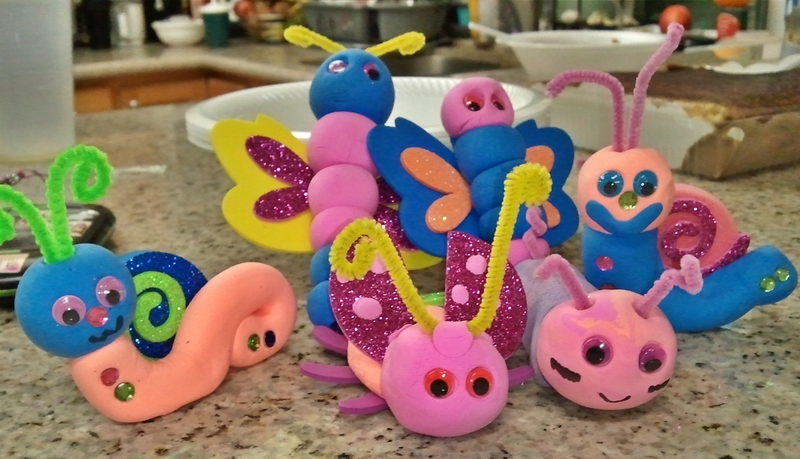 The girls who made the butterflies resorted to shoving a pipe cleaner down the center of the body of the butterfly because the individual balls of clay wouldn’t stick to each other very well. She also used a small strip of clay to hold the wings in place. It kind of worked. Glue would have been better. The wings started to fall off as the clay dried. The pink ladybug used to have rhinestones where all the pink spots are on the wings. But they all fell off. Surprise! Again, glue. I had to reattach the wings with some glue as well. They stayed on ok while the clay was still pliable, but when it dried the wings fell off.